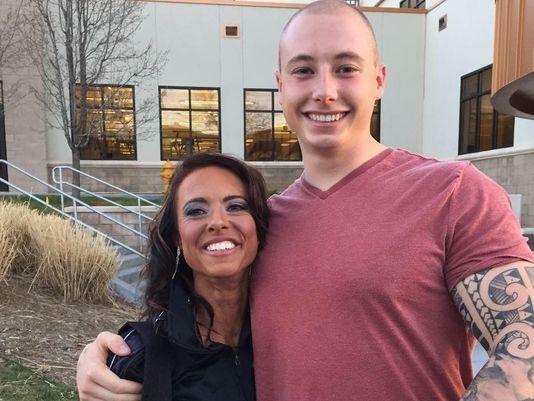 After Carole Adler’s 21-year-old son died while training to become a Colorado State Trooper, she continued to text the cadet’s phone, saying she loved and missed him, trying to mend her broken heart. One day, she got a text back. 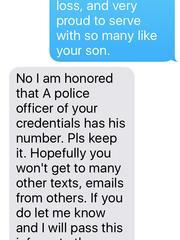 Kell Husley, a police sergeant in Greeley, Colorado, received a new phone number and was getting the messages Adler was sending to her boy, Taylor Thyfault. STORY: Parents Confess: Do You Read Your Kids’ Texts? “So I sent a text back and identified myself, and said ‘I’m with the Greeley Police Department, and I don’t think your texts are going where you think they are,’” Husley told the KUSA television station in Denver. That text began a relationship between the grieving mother and police sergeant who was doing the job that Thyfault was determined to do. Thyfault had many goals for his life. His high school do-list included some teenage pipe dreams – wrestle an alligator, swim with sharks, go cliff diving – and some goals he was able to accomplish – graduate high school, join the army, be the best son possible. Then, in May, Thyfault was struck and killed by a driver-on-the-run during a police chase near Longmont, Colorado. The driver accused of killing the cadet has been charged with first-degree murder and attempted murder – another police officer was critically injured — according to Longmont Times-Call. At first, Husley, a 33-year veteran officer, ignored the texts that were coming over his new phone, which had been assigned Thyfault’s old number. Then, after a particularly wrenching message, he texted the cadet’s mother and offered to change the number. Adler, however, likes the connection, the kismet of her boy’s cell phone number resting with a police officer. And Husley likes hearing about Thyfault’s passion, which reminds him of his cadet days. Taylor Thyfault was posthumously promoted to a Colorado State Patrol Trooper, according to a memorial Facebook page. Yahoo Parenting was unable to reach Adler or Husley for comment.